Immigration and Customs Enforcement (ICE) wants us to believe that the people they arrest and deport pose a threat to public safety. They claim that anyone with a felony conviction is dangerous, but we all know that this is not true. We all make mistakes but are also more than the sum of those mistakes. In the past decade and half since being released, Daniel has committed himself to the environment by sorting recycling, driving recycling trucks, and engaging in education on recycling. For the last ten years, Daniel has worked at the Ecology Center, a Berkeley, California nonprofit where he directs the recycling program and manages the community’s curbside recycling program. 1. Sign this petition for Daniel directed to ICE Field Director Craig Meyer. 2. Raise awareness on social media about Daniel's case. Tweet about it and spread the word using hashtags #FreeDaniel and #Not1More. Speak out and tell us your stories! I write to you as a concerned community member regarding Daniel Maher (A035 945 225), a Berkeley worker and community member. In 1977, when he was three years old, Daniel Maher came to the United States from Macau as a permanent resident. As a twenty-year-old, Daniel was talked into taking part in robbing a store with a group of other boys. He was arrested immediately afterwards and served seven years in prison. ICE also detained him for an additional year. Daniel’s deportation officer recommended that he be released from detention, understanding that his conviction did not define him. Since being released more than a decade ago, Daniel has committed himself to the environment by sorting recycling, driving recycling trucks, and engaging in education on recycling. For the last ten years, Daniel has worked at the Ecology Center, a Berkeley, California nonprofit where he directs the recycling program and manages the community’s curbside recycling program. In June 2015, two decades after his conviction, ICE agents raided Daniel’s home and took him to a detention center. 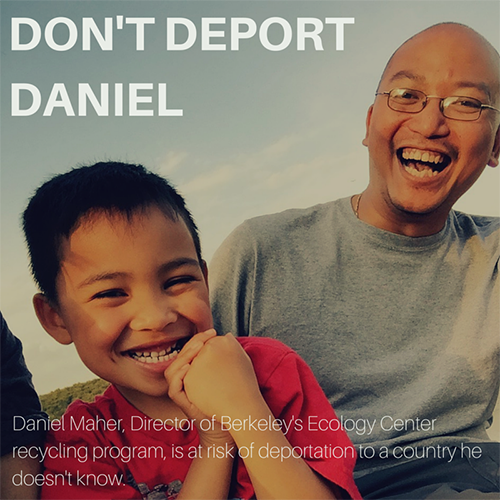 Daniel should not be considered a priority for deportation. He has committed his life to bettering himself and the community around him and should not be punished for a conviction for which he has already served his time. For these reasons, I ask you to exercise your prosecutorial discretion and drop the charges against Daniel.